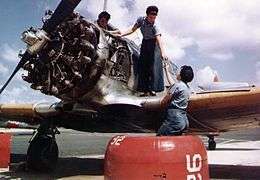 Dungaree is typically associated with working clothes, here seen on mechanics working on a Texan trainer during the Second World War. Dungaree fabric (used in English since 1605–15, from the Hindi dungrī) is a historical term for coarse thick 2/2 twill-weave cotton cloth, often coloured blue. Cotton twill with indigo dyed warp thread is now more commonly referred to as denim, or more specifically blue denim. The word is possibly derived from Dongri, a dockside village near Mumbai. In US English the term is used for hard-wearing work trousers made from such fabric, and in British English for bib overalls in various fabrics, either for casual or work use. By 1891 Kipling was using the word to refer to a kind of garment (in the plural) as well as a fabric. Dungaree appears to be a subset of denim and typically refers to the most common style of blue denim. Typically only the warp threads are pre-dyed with the traditional colouring agent indigo, the weft threads are left uncoloured (white), resulting in the unique fade patterns of the fabric. Denim however refers to cotton twill which may be warp dyed, undyed, or dyed after weaving. Denim may be 2x1 or 3x1 twill. It's unclear what types of twill dungaree fabric was available in traditionally. In United States, the mill at Shady Lea, North Kingstown, Rhode Island, was built in the late 1820s by Esbon Sanford to manufacture a cotton-wool blend twill fabric called Kentucky Jean, resembling a cross between burlap and the dungaree fabric of today. 1 2 "Dungaree". Oxford Dictionaries. Retrieved 3 October 2012. ↑ 1891, R. Kipling, poem, The City of Dreadful Night "He's got his dungarees on." ↑ R. Kipling, The Bridge Builders, "Peroo was standing on the topmost coping of the tower, clad in the blue dungaree of his abandoned service ...". ↑ "Dungaree". Merriam-Webster. Retrieved 3 October 2012.